Citizens of the World Mar Vista (“CWC Mar Vista”) is proud to be ranked in the top 5% in both English and math out of all LAUSD, charter and magnet elementary schools. Based on the school’s strong performance, CWC Mar Vista is ranked #1 among the comparable list of local LAUSD schools provided by the District. Moreover, all demographic groups, or subgroups, outperformed both LAUSD and the state of California. Please see details below. Citizens of the World Mar Vista showed a strong performance on the 2016-2017 California Assessment of Student Performance and Progress (CAASPP). This performance shows that our students at CWC Mar Vista are receiving a rigorous education, which supports them to perform at high levels while also making significant academic gains. 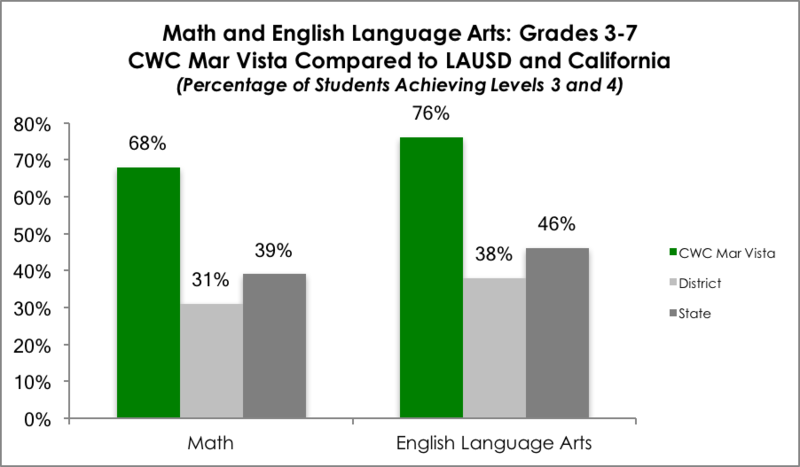 CWC Mar Vista outperformed both the district and the state, ranking in the top 5% in both Math and ELA of 621 LAUSD elementary schools (including all charters and magnets). This ranks CWC Mar Vista #34 in Math and #31 in English Language Arts out of these schools. In Math, on average, 68% of CWC Mar Vista students tested at or above grade level on the state assessment test, an increase of 10% over the previous year. In English Language Arts, on average, 76% of CWC Mar Vista students tested at or above grade level on the state assessment test, an increase of 14% over the previous year. All CWC Mar Vista subgroups outperform both the District and the state of California. For example, in English, 32% more African American students perform at grade level compared to LAUSD, as well as 28% more Latino students, 17% more Caucasian students, 32% more economically disadvantaged students, 38% more English learners, and 59% more students with disabilities. 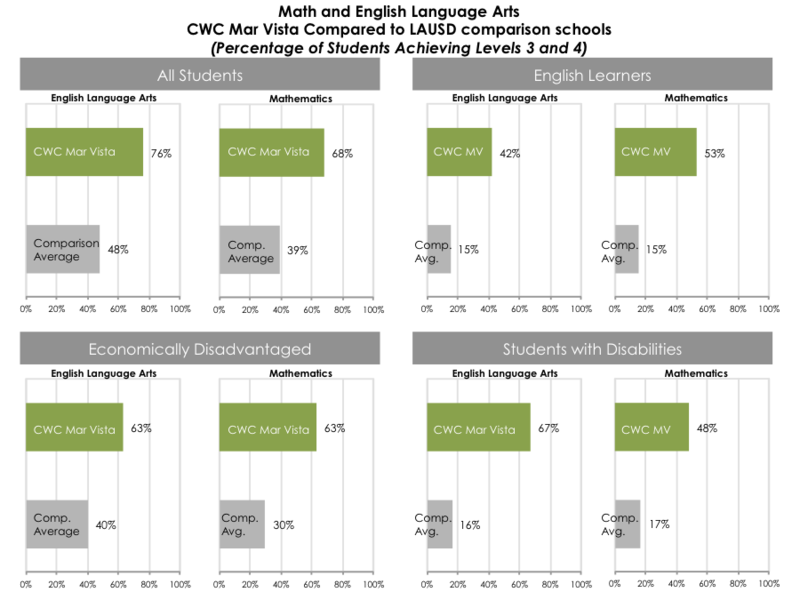 In math, 30% more African American CWC Mar Vista students outperform LAUSD, as do 31% more Latino students, 13% more Caucasian students, 38% more economically disadvantaged students, 47% more English learners, and 41% more students with disabilities. As shown in the chart below, CWC Mar Vista dramatically outperformed comparable LAUSD schools in a list provided by the District. This included strong performance among English learners, economically disadvantaged students and students with disabilities.